You don’t have to be a sponsored climber to feel like a total badass. Haven’t you ever topped out a climb and felt like a complete champion? I know I have. It could be an airy 5.9 lead 2,000 feet off the deck, redpointing your first 5.11c, or having a climb so dialed that you don’t need to think twice before slotting that red C3 below the crux. You realize that there are people out there crushing harder than you, but for that one moment nothing could knock the sunshine from that ear-to-ear grin. This is the feeling I was after when I started planning my first Birthday Challenge. The Birthday Challenge is an arbitrary game played within the climbing community. The rules are simple: climb as many pitches as you are old to some degree or variation. The details are left for you to decide – sport, trad, top rope, free solo, routes with “poodle” in the name – the possibilities are endless. I first heard of this challenge when the video 35 was released almost a year ago, which celebrates the climber’s way of life through one man’s journey to climb 35 routes on his 35th birthday. What a great way to celebrate the freedom of life on the road and another circle around the sun! As fate would have it, my birthday falls in the middle of winter when daylight is limited and weather is often less than ideal, but I embraced the added challenge. My goal would be to lead 25 different trad routes in less than 24 hours. The sun was just peeking over the horizon when I started my first route. Thinking about the day ahead filled me with anxiety, but I felt compelled to succeed. I had yet to start and I already felt like I was moving too slow. Each movement of my hands and feet felt forced, like an infant learning to walk. In order to succeed I needed to exchange slow and methodical for steady and efficient. 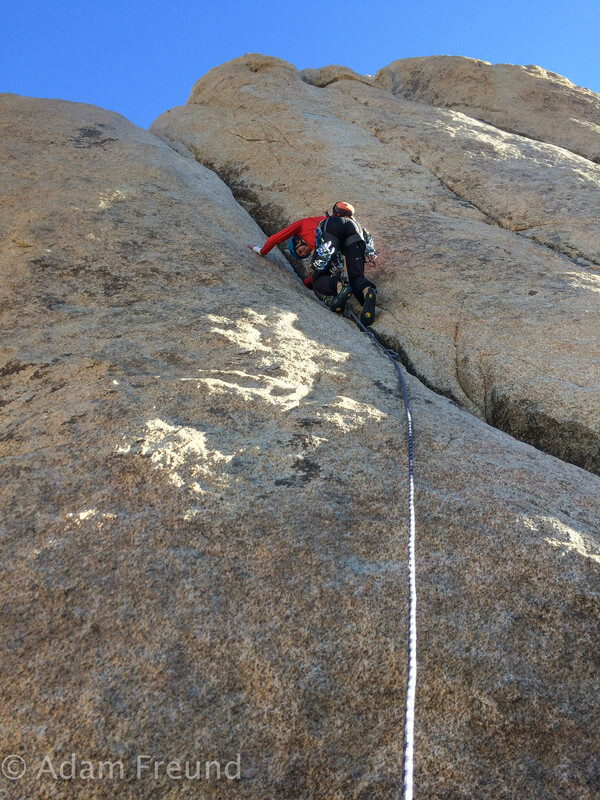 The first 10 feet of the first route proved mentally taxing. Climb up 10 feet, down climb 5 feet, climb up 5 feet, mutter curses under my breath, and repeat. Stubbornness runs through my veins, so when Adam suggested I move on to the next climb on my list rather than wasting more time on the current route I cringed. The thought of giving up on this climb, a climb that should have been easy for me, left a sour taste in my mouth, but I knew if I still wanted a chance at completing my challenge I needed to swallow my pride and focus on sheer quantity rather than quality and style. 12… 13, I managed to check off two more routes on my list, but time was slipping from my ever weakening fingers. As I sat at the base of what would be route 14, I watched the sun kiss the horizon as storm clouds slowly crept closer. 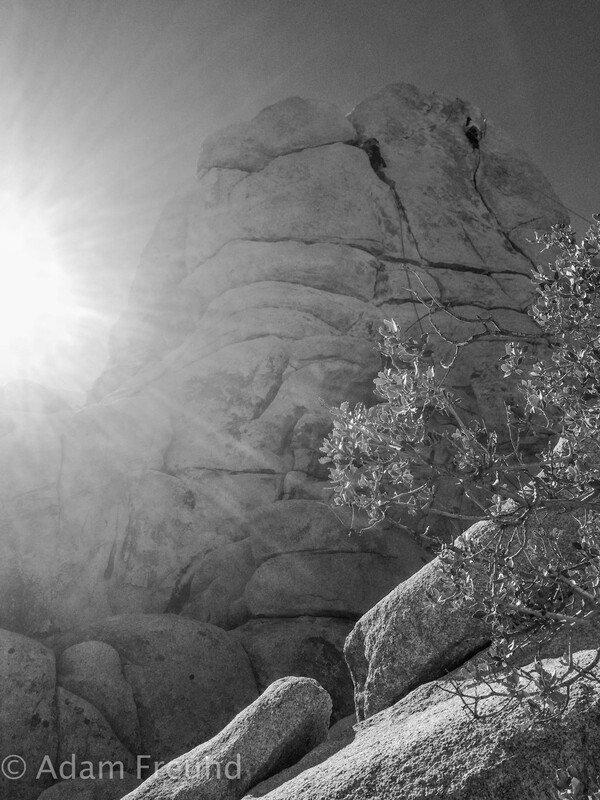 I had climbed a third of the way up the gritty granite only to realize my fatigued arms would not allow me to execute the moves my brain told me I needed to perform. Shamefully, I asked to be lowered back to the ground. A low rumble of thunder echoed in my empty stomach and a feeling of defeat washed over me.